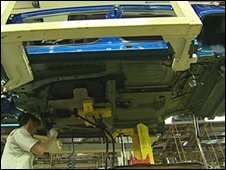 A union representing workers at the Honda factory in Swindon fears plans to shed 1,000 posts could lead to compulsory redundancies. Honda has introduced two new programmes which will lead to a smaller workforce. Workers who opt for the Associate Release Scheme (ARP) scheme will leave with a payout which exceeds the statutory redundancy minimum payment. Some staff can also opt for a six month sabbatical via the Personal Development Scheme before returning to their jobs. A company statement reads: "Honda recognises that during these uncertain times, there may be some associates who would want to consider self development leave or other release options." Sam Tipper from Honda said staff had been told about the two new schemes "first thing on Monday in response to market conditions". "There is no target for people to sign up to these schemes," he added. Regional officer with Unite Jim D'Avila said he wanted to know what the company intends to do if the two new schemes fail to reduce the headcount. "Neither Unite nor Honda knows what the take-up of the ARP and sabbatical schemes will be," he said. "But we all know that if these or something very similar to these schemes are not successful in voluntarily reducing the associate headcount, then it brings nearer the day when the possibility of compulsion will be used. "The position at Honda is very precarious." Honda has already announced plans to cut production at its plant in Swindon, which will close for 50 days in 2009. The 50-day shutdown will mean factory will close for the whole of February and March. The company plans to make 61,000 fewer vehicles in Japan and Europe as it struggles to cope with slowing global demand. Earlier this year, Honda announced it would cut output at Swindon by 32,000 units. With Friday's announcement of further production cuts, the Swindon plant will now produce 175,000 vehicles this financial year, down 23% from an original forecast of 225,000 vehicles.